DeBelle Fairness Talc has unique benefits of Pearl Dust, for smooth and even skin tone. It helps to brighten skin and keep you refreshed all day long. It also contains Menthol and turmeric oil, which has effective anti- bacterial properties and promotes skin radiance. Most suited for summers to keep you dry, since it absorbs moisture very well. The fragrance is very soothing and refreshing. Made of premium quality ingredients, it is sure to last for long. Enriched with anti-oxidant rich ingredients, this product will soften and soothe your skin. Carries anti-pigmentation and anti-tanning properties. The goodness of Turmeric oil in the Talcum powder helps to moisturize and protect your skin. Ideal for daily use for both men and woman. It is suitable for all skin types. Fairness talc with unique benefits of Pearl Dust. Carries anti-pigmentation and anti-tanning properties. Softens, cools and moisturizes skin. Explore the entire range of Talcum Powder available on Nykaa. 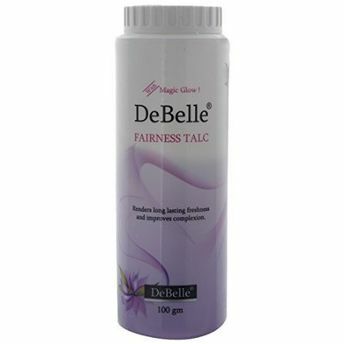 Shop more DeBelle products here.You can browse through the complete world of DeBelle Talcum Powder .Alternatively, you can also find many more products from the DeBelle Fairness Talc range.